Check out what we found this morning. While we admit it is a wee bit of a stretch to make this Dodge related it does have a 1,000 hp Hemi! So if you see this next to you at a stop light don’t bother asking if it has a Hemi and just keep your foot on the brake. Somethings you just cant win. Early last year, Drew Phillips spotted the Frogman Rocket II doing its best to blend in among the other, less-outrageous creations at the Grand National Roadster Show. 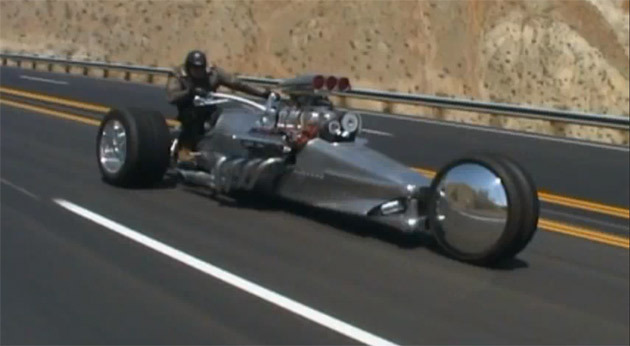 At the time, he wondered what it must be like to throw a leg over a trike powered by a supercharged Hemi V8 with over 1,000 horsepower. Now we know. The owner is a kindly soul by the name of Tim Cotterill who decided to have a short film made about the creation. The action focuses mainly on long, dreamy shots of the Rocket II doing what it does best – generating speed and shoveling bucketfuls of fuel down the engine’s throat via two Holley double pumpers. The sound of this thing is beyond intoxicating, and the craftsmanship only helps to return us to our wide-eyed elementary school selves. Crafted by none other than the Blastolene – the same crew that’s responsible for Jay Leno’s tank car – the Rocket II wears the kind of over-the-top style that makes us downright giddy. While you woun’t be able to get one of these for your very own here at Prince Frederick Dodge Chrysler Jeep you can come by and check out what we do have with Hemi’s in them. Maybe you can make your own fun.